Elastic Path, an e-commerce company helping luxury brands use beacon technology, came up with a concept store called Britney Broden to illustrate what's possible. The store of the future knows what you were doing last night. Say you added an item to your online shopping bag, but then didn't purchase it. When you step into the actual store, the salesperson will know what items you were looking at online, how much you spent last time you shopped there and even what size you are. This kind of targeted marketing and data mining is being offered as an option for luxury retailers as the boundaries between shopping online and in stores become more blurred. The idea is that seamless, customized service is what customers want, and makes them feel pampered and special. But some customers find it just plain creepy. "You can create an experience that is highly personalized, and the customer appreciates it, but it's very easy to go a little too far and be creepy and invasive," said Matt Dion, vice president of marketing for Elastic Path, a company that offers this type of software. "So I think the responsibility is on the brand to use the data in a responsible way." Elastic Path's technology works with store loyalty apps and beacons inside the store, which are small sensors that "talk" to the app on a customer's phone. From there, information is beamed to a salesperson within the store. Dion said that an expression he's heard lately is "trust is the new currency," and it resonates when it comes to using beacons in a store. It's important to not use the data to make the customer's experience an uncomfortable one. "The onus is not on technology, it's the people using the technology," Dion said. One way a store can safeguard against creepiness is by making sure customers opt in to sharing their data, so they don't feel violated when an associate at the store brings their size without asking what it is. The company's software is new, and says the technology is currently in proof of concept stages with several top luxury brands. But there are other beacons currently being tested. Macy's (M) department store tested beacons in its San Francisco and Manhattan stores over last year's holiday season, and said it's expanding beacons to all stores nationwide. 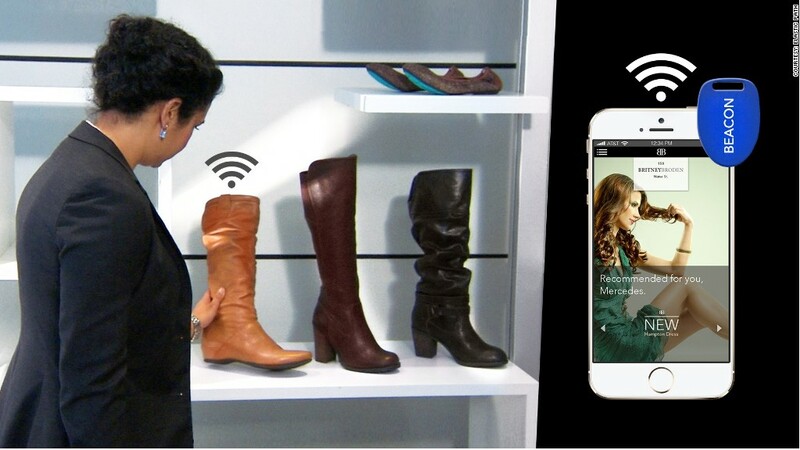 Luxury retailer Michael Kors (KORS) announced plans to experiment with beacons in its flagship London store next year, and department store Lord & Taylor has said it will also begin using the technology. It's possible that once beacons really catch on, they will be pervasive. " You'll suddenly see 10 major chains in every category will have implemented it," said Lewis Paine, an expert on retail at GfK, a market research company. He said that beacon technology is an easier sell to millennials, who are expected to embrace it, as long as it's sold in a compelling way. "People are willing to share their information if they think they are getting something back in return," he said. And beacons are only the beginning. Dion said the future of retail may mean buying items with your smartwatch or using "intelligent mirrors" in dressing rooms. Those mirrors may have the ability to take a photo so you can remember what different items looked like after trying them on. Or instead of trying on clothes, the dressing rooms of the future would simply digitally overlay them on your reflection. "But again, a mirror and cameras in changing rooms," Dion said, "that's got a huge potential for abuse and crossing the creepy line."